Product prices and availability are accurate as of 2019-04-21 03:55:18 EDT and are subject to change. Any price and availability information displayed on http://www.amazon.com/ at the time of purchase will apply to the purchase of this product. The Pillivuyt oval bakers are a classic in the culinary world - brilliantly glazed and built to stay beautiful for years to come. Like all Pillivuyt cookware, the oval bakers have multiple functions for baking and roasting and the deep sides prevent splattering in the oven. This is an exceptionally attractive piece and can be used on the dinner table with your fine china. The heat conduction is outstanding and the dish will retain heat at the table throughout the meal. Dubbed "the original non-stick cookware" by experienced users, Pillivuyt porcelain is surprisingly easy to clean. Baked-on foods will slide off easily with a short soak or a gentle scrub. We stand behind our product and guarantee it against crazing or discolorations in the glaze. This extra large oval baker measures 14 1/2 by 10 1/2 inches and is over 2 inches deep with a capacity of 3.5 quarts. 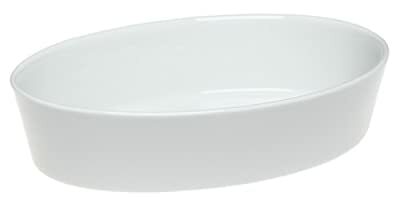 This 14-1/2-by-10-1/2-inch oval dish with 2-1/8-inch straight sides bakes a filling gratin entrée for six or a dinner of sausage-stuffed shells with the ideal heat conduction for a superbly executed recipe. An exquisite specimen of fine French pottery, this porcelain baker is simple in appearance with its milky white color, smooth finish, and rolled edges yet durable due to its proprietary time-tested ingredients and thick-walled construction. 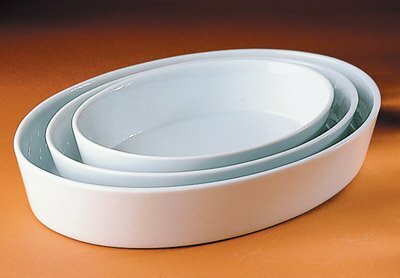 The baker's pristine beauty and excellent heat retention make it a wonderful serving vessel that goes from oven to table, and its plain design is certain to blend with all dinnerware, from casual and modern to formal and vintage.